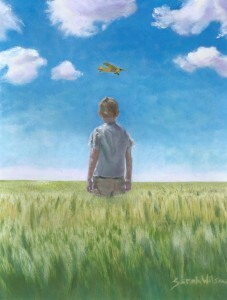 The boy and the old plane both wished to fly, but the plane no longer believed in wishes. It had been so long since it had flown; abandoned, broken, and alone. The plane had forgotten how to believe. It’s hard to believe when you’re just parts in a shed. Separated so long from the sky, it’s easy to forget you can fly. The boy had spent his whole life watching airplanes fly past him. Wishing on each one, that someday he would go with them. Wading waist-high in the wheat, watching a Cub fly away, the most unusual thing happened. He heard the sound of a radial engine. How could that be? That’s not the sound a Cub makes. Just then the wind whipped a path across the wheat and waved at him. “Over here, follow me,” the wind beckoned. He turned the corner of his curiosity, following the rumble-clicking, lope, lope, loping of the radial engine. Over the field, through the orchard, and past the old barn the sound lead. It ended at the door of a shed. The boy turned the knob and peeked in. 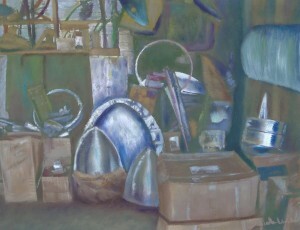 Stacked floor to ceiling; boxes and bags and parts and pieces sat motionless in the dark. 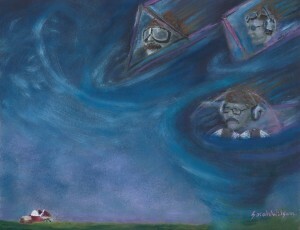 Once inside, his imagination opened as wide as his eyes when he saw a plane looking back at him. “Why should I believe you?” the plane replied. “Restore me,” the plane replied. “I will be done on the Eighth Day of the week,” the plane replied. There on the left of the shed, hiding in the corner of an old panel, was a very small clock with a set of very red hands. 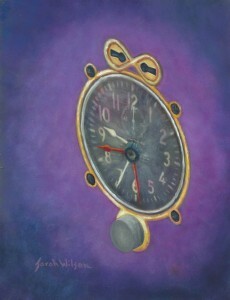 The boy thought It must be a special clock because small things hold the biggest secrets after all. If he was going to hide magic in something, he would hide magic in something small. What do clouds feel like on your skin? Does the wind know you’re coming and tell the wheat to wave at you? If you spent your whole life in the sky would you eventually turn blue? Minutes spent wondering about the most wondrous things. Things planes and children always take the time to do. The boy sat down on the floor of the shed. Next to the boxes and bags and parts and pieces, as dreams of flying flew through his head. The plane smiled inside. It had been so long since the plane had a little boy for company. The boy smiled on the outside as giggles bubbled out of him. 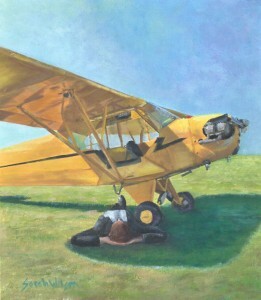 The plane waited for the boy to reply, but he had fallen asleep on the floor of the shed. The plane smiled inside. It had been so long since the plane had a little boy asleep under it’s wing. 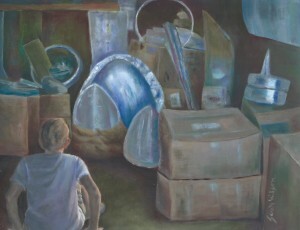 In the cool darkness of the shed the boy started to dream. Perhaps it was a dream, but no one can ever be sure if dreams aren’t real. 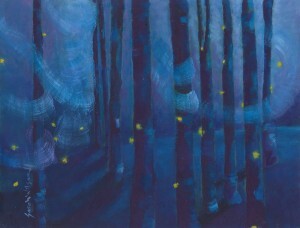 He dream’t that wild men blew through the meadow with wind and blue flames in their hair. Flying biplanes and wearing boots as tall as their knees. They pulled the wind out of their hair and wrapped it around the barn like a scarf. Then the men blew flames across the beams to break the barn’s roof apart. 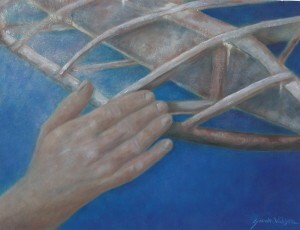 With hands as big as hams, they picked up the wood and wove it into the plane’s wings. Then the wild men laid leather coats on the seats and took the shirts off their backs to patch the plane’s fabric with their sleeves. They laughed so loud it shook the ground. Then they poured gas from their flasks into the engine, until it glowed bright blue. When the plane was done, and shining like new, the wild men wrapped the wind around their necks again and blew back from where they blew in. Somewhere over the horizon, half-past the point of no return, the wild men danced with the wind over the top of the moon. When the boy woke up it was almost dark. It had been the most distracting day. 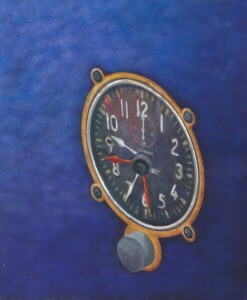 Such unusual things; magic clocks and talking planes. Now his tongue tasted like the color blue. The boy didn’t want to leave, but he had so many things to do. The plane didn’t reply. Nothing says a lot, it just doesn’t use any words to say it in. “I promise I’ll be back,” the boy said. “I promise I am going to restore you and we will fly someday. I won’t forget you. I love you, you’re my Wish Twin.” Then the boy closed the door of the shed and the plane was left alone in the dark. Just then, on the left of the shed, hidden in the corner of an old panel. 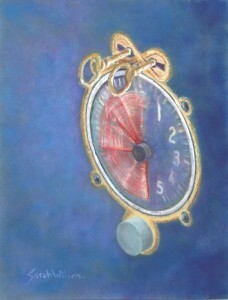 The very small clock, with a set of very red hands, started to change…and glow. Many years had passed, almost ten, until the boy waded waist-high in the wheat once again. 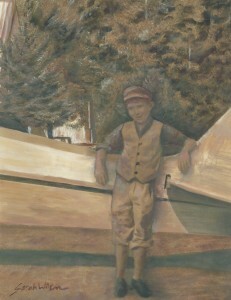 The boy was now a young man. It was the evening before he was to leave for college. His plans had grown as tall as him. He had majors to declare and graduate school to attend. Jobs to win and a house to buy, maybe two? He was such a busy young man, with so much to do. 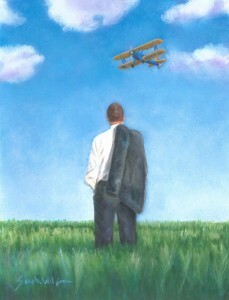 Lost in his ambition, he didn’t notice the P-51 flying past him until he heard the sound of a radial engine. He looked up and questioned, How could that be? That’s not the sound a Mustang makes. Just then he remembered what he had forgotten to remember again. 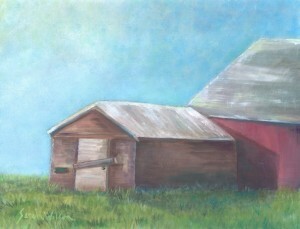 Over the field, through the orchard, and past the old barn the young man ran. Tripping over his guilt, he fell short of his expectation’s at the door of the shed. Ashamed to face the plane he had left alone for so long. The young man stared at the door in front of him. The young man turned the knob and peeked inside. Stacked floor to ceiling; boxes and bags and parts and pieces sat motionless in the dark. Just as he remembered them, but different. The plane looked tired and older then it had been. The young man opened the door wide to let the sunlight in, then gently brushed the dust off the corner of the wooden wing. The young man blushed and looked back at the door. Thinking his actions before he did them. “I don’t have time,” were the only words he could say. The plane starting thinking very seriously. Planes do that when they want to tell you something you don’t know is true, but they do. The plane had so many things to tell the young man before he went away. The plane knew it would be a long time until they talked again. So much was about to happen to the young man. The plane wanted to warn him. “Listen to me,” the plane said. “Stay out of the trees. There’s burble there. Burble is wind that’s lost its way. It doesn’t know what to do, it’s confused. Burble starts to listen to what the trees say, instead of what the wind knows is true. Burble in the trees can be very dangerous to you. Listen to me. Beware of the slope, don’t go there. Once you start down the slope you can’t stop. Never listen to what the slope has to say, put on your brakes and brake straight ahead. Then take off and fly the other way. Listen to me. Learn to read the clouds. Indifference can turn to anger in an instant. If the clouds start to boil, bark, and turn dark, fly towards the light. Never stay in a dark sky. 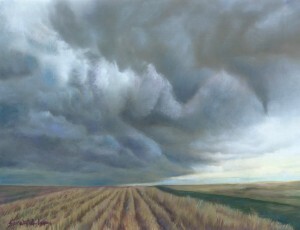 Learn to feel the gust front approaching and watch for ripples on your skin. They warn you that there is danger hiding within. The plane didn’t reply. Nothing says a lot, it just doesn’t use any words to say it. The young man boarded the door and left. 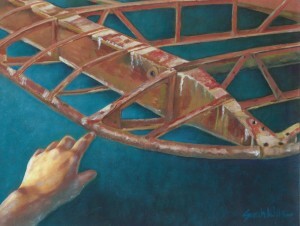 From inside the darkness of the shed the young man could not see the plane’s rudder wagging back at him. Planes can never hurt anyone back, only people can. 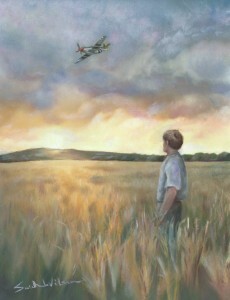 Had the young man spent time with the plane that day, he would have learned his life had a much different plan for him. The next morning the young man sat on the dock of the lake, and hung his head over the edge with his legs. He was ashamed of the way he had treated the plane. He said inside, Forgive me, please? I’m sorry I didn’t make time for you. The sound of a radial engine answered him. 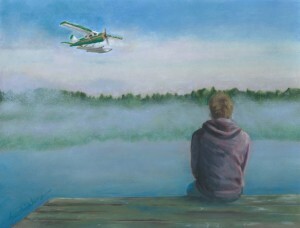 A Beaver lifted off in the fog as his tears filled the empty space its float’s left on the surface of the lake. The young man knew what he had to do. So over the field, through the orchard, and past the old barn he ran once again. 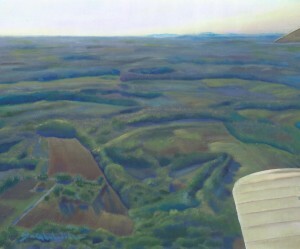 The young man was alr eady past the orchard and through the field when the plane replied, “I forgive you. I love you too.” The plane smiled inside, grinning wing to wing. It had been so long since the plane had said, I love you too, to him. The young man did not know what the plane had mean’t, when ten years ago the plane had told him, “I used to fly with a little boy like you.” Planes live forever so time is different for them. The young man did not understand the little boy the plane used to fly with, was him. Many years had passed, almost twenty, until the young man waded in the wheat again. He was now a man. So tall the wheat barely touched his knees. The young man had grown up to to be a very big deal indeed. Made a lot of money and was rich and famous. On this day he didn’t feel like a big deal at all. Counting all his would’ves, could’ves, and might-have-beens, the man didn’t notice the Stearman flying past him until he heard the sound of a radial engine. He looked up and remembered what he had forgotten to remember again. Just then the wind whipped a path across the wheat and waved at him. “Over here, follow me,” the wind beckoned. Following the rumble-clicking, lope, lope, loping of the radial engine the man ran. Over the field, through the orchard, and past the old barn. The shed was still there with the board nailed over the door. Just as he had left it so many years before. The man ripped the board off the door with such force, the door flew from its hinges onto the floor. A whew flew out of him too. The plane would know what to do. “This is the worst day of my life. I’m about to lose everything. My job, my houses, my reputation, my money. What will people think of me? What should I do? “Nothing.” the plane replied. “When you worry and are in a hurry, you make mistakes. Sit and rest awhile. I have so much to tell you. It will take some time to restore me, but time flies by when you like what you do. I think we will start today. The man smiled inside and his smile skipped up his chin all the way to the top of his forehead. It was the first smile that had run around his face in awhile. The mans’ thought’s froze inside him. They cracked his pride. The plane was right. He wanted to open his mouth and say, I was wrong, but the words stuck to his tongue. He was too embarrassed to unstick them. The man opened the leather pouch and pulled its inside’s out. He found a picture and an airplane registration. The man picked up the old picture and held it to the light in the shed. “Hey, that kid looks like me,” the man said. The plane starting thinking very seriously. Planes do that when they want to tell you something you don’t know is true but they do. If you remember your consequences before they happen, you won’t have to regret them. The plane wanted to protect him from a mistake he was about to make again. The worst day can get worse but it can always get better too. The plane waited for the man to reply but he had fallen asleep on the floor of the shed. Being busy makes you very tired. The plane beamed with pride. It had been the best day of the plane’s life watching the boy grow into a man. But planes live forever, so time is different for them. In the cool darkness of the shed the plane said, “There are just a bunch of old parts in this shed. Parts of so many planes, all part of the same. All waiting for you to fly us away. All waiting for the boy who sat in our seats, wondering the most wondrous things, to come back again. You don’t remember us but we remember you. We saved all t he extra patience we had waiting to see you, so you could spend time doing all the things you never got to do. I would give my frame to protect you. You are my first best friend. I believed in wishes again when you said you needed me today. Wishes need to be needed to come true, planes need to be needed too. A wish that is good and true, is never too good to come true. Just then, on the left of the shed, hidden in the corner of an old panel. 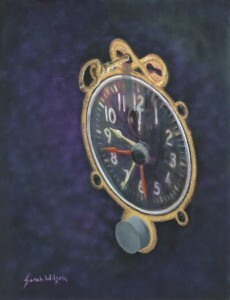 The very small clock, with a set of very red hands, started to change…and move. The older man woke up in the grass and looked at the face standing above him. The face opened a place inside his memory he had forgotten to remember again. It was his son. The older man sat up and hit his head on the strut of the Cub. He rubbed all his questions and a lump, What just happened? Was it a dream? Perhaps it was a dream, but no one can ever be sure if dreams aren’t real. The older man walked into the shed. It was empty except for a small piece of paper on the floor. He picked it up and saw it was the registration for the Cub outside the door. His name and address looked back at him. He turned the registration over and in his handwriting he saw his present. On the right, right after it, was written, Jr.. In the space where the paper had been, was a watch. 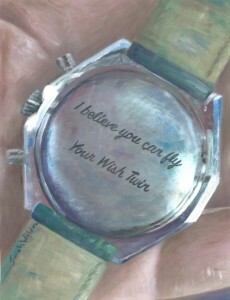 It was the pilot’s watch he had sold on the worst day of his life. He lifted the watch to the light of the shed and read the inscription. 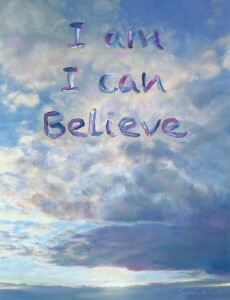 I believe you can fly. Your Wish Twin. 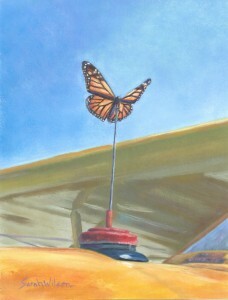 Just then, on the left corner of the shed, a butterfly flew out the door and landed on the fuel float of the Cub. The older man looked up when he heard the sound of a radial engine.